Often we talk about changing our classrooms, putting students at the centre, connecting with authentic audiences and flipping instruction. However, the first thing that often needs to change is the role of the educator. Instead of focusing on being a teacher, the focus needs to be on becoming a learner. From using social bookmarking to connect with a community to using a blog in order to share with the world, Aaron will explore the different possibilities and potentials for lifelong learning and why teachers need genius hour too. When we talk about flipping the classroom, the focus is often in regards to instruction. However, something that also needs to be flipped is the role of the teacher. We need to move from being the sage on the stage to what Erica McWilliams calls “a meddler in the middle”. That is, “a re-positioning of teacher and student as co-directors and co-editors of their social world.” This re-positioning starts by re-focusing on learning. As David Culberhouse suggests, “The best fuel to feed the fires of our creative and innovative core is learning. New learning, learning that stretches us.” The question then is how might we create conditions which support teachers as leaders in the learning, not just of the learning. In his recent book, From Master Teacher to Master Learner, Will Richardson provides nine different learning qualities: model, unlearner, co-learner, curator, open sharer, connector, maker, digitally literate and champion of diversity. Whatever qualities are shown, what matters most is that teachers are first and foremost learners. As he states, “The world has changed. Knowledge is everywhere. Teachers must become master learners instead of master knowers” The question though is what such learning might mean. The role of learner can take on many guises. Sometimes it is co-creating the learning experience with students, other times it is simply learning something new and going through that process themselves. As George Couros wonders, “Can you imagine when a teacher gets really excited about their learning, the difference that makes on their students?” It always comes back to the learning. In relation to co-creating, there are a range of models that can be used to support this process. The most obvious seems to be the many different iterations of the ‘Inquiry’ model, where students help guide their own learning. The reality is that inquiry means many different things to many different people. You just need to place some of the different models next to each other to see this. Another model of learning is Disciplined Collaboration. Developed by Alma Harris and Michelle Jones, it focuses on teachers working through a cycle of collaboration, innovation and reflection. Although not traditional co-creation, the focus on student, through data and evidence, rather than being dictated by the curriculum. Another model that empowers teachers as learners is the Modern Learning Canvas. Developed by Richard Olsen, it provides a collective space to talk learning and identify areas for change and innovation. One of the problems with many inquiry based models is that they begin with a question and work towards a solution. However, as Peter Skillen argues, sometimes what is important is tinkering and engaging in playful learning. Chris Wejr shares how he provided time for his teachers to tinker and innovate, while John Spencer talks about having a personal genius hour to follow up passions outside of teaching. In her adaptation of the Design Thinking model, Jackie Gerstein talks about the importance of not only understanding the learning process, but clearly articulating and demonstrating this. A part of this is celebrating the iterative process of learning. As she suggests, “the educator as a lead learner normalizes, embraces, models, and reinforces the iterative process of learning.” This involves a cycle of prototyping, testing, failing, tweaking. Technology plays an important part within all of this. Whether it be developing a PLN, sharing ideas, finding inspiration, openly sharing the learning or making stuff worth stealing, much of this is enabled through the use of various tools and applications. Our task, as David Weinberger suggests, is to, “build networks that make us smarter”. Collaboratively developing a presentation with Steve Brophy. Crowdsourcing ideas and resources associated with feedback and iPads. Exploring potentials associated with intervention. Investigating different possibilities for digital workbooks. Tinkering with different ways to share in and out of the classroom. What is significant about each example of learning is the shared experience. Learning is never in isolation and it is so important to remember this. Also, if it is then we are at a time of interconnectedness when it is easy to gain feedback. So what about you? What learning have you been a part of that has stretched you? What qualities did you show? How did you go about it? What challenges did you face? How did you share it? 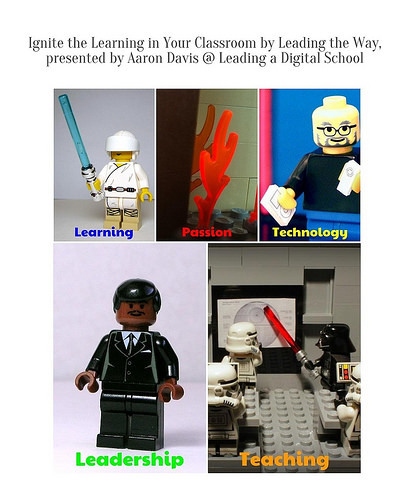 Ignite the Learning in Your Classroom by Leading the Way #Digital15 by Aaron Davis is licensed under a Creative Commons Attribution-ShareAlike 4.0 International License.